The object of the game is to make a Mill or 3 in a row (horizontally, vertically or diagonally) while trying to prevent your opponent from making a Mill. When you make a mill, you get to remove one of your opponents marbles from the board. A challenging game of strategy for ages 6 and up. 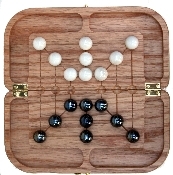 This game folds up with all the marbles stored inside. A great game to take anywhere you go. Comes with 18 large marbles (7/8") and instructions.